We'd like to send out a huge thank you to everyone who attended; it was great to see such a large turnout, and such a lively interaction with the speakers, with lots of questions which helped expand the discussions. It was also great to see such a large group stay after the talks, and at the pub afterwards, as #FuturePub became #ScholarlySocial for the end of the evening. 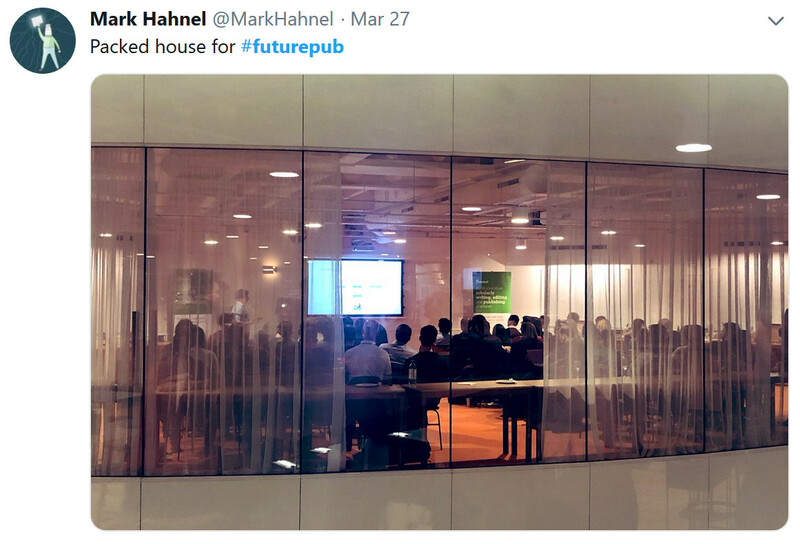 We've now hosted over a dozen #FuturePub events, since our first back in January 2014, and have somehow become known as "a staple of the London science tech/publishing scene" (thanks Eva!). 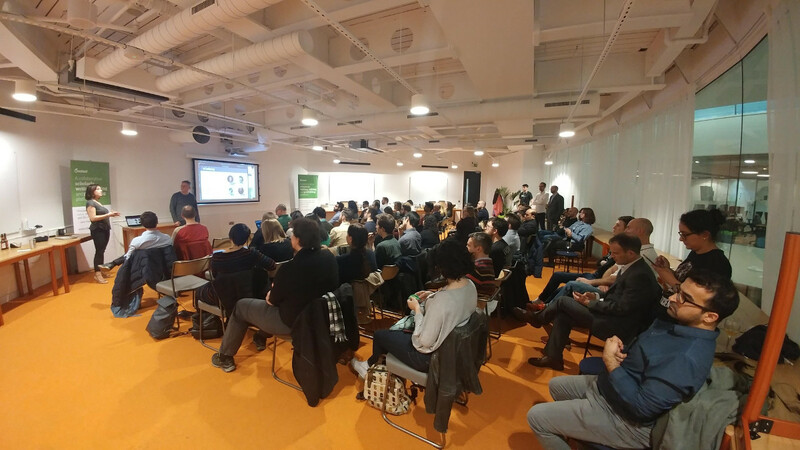 This time around we hosted the event in the 'Classroom' at our WeWork offices near Kings Cross...and only just had enough seats! Five or six quick-fire talks cover a range of new and exciting developments in science & publishing tech. The rest of the evening is then open for discussions and conversations over the remainder of the drinks and/or pizza! We get a great mixture of attendees from the research, publishing and start-up communities, and we usually head to a nearby pub to continue on into the small hours. For this #FuturePub we once again teamed up with Scholarly Social for the trip to the pub afterwards. The next #FuturePub will be in Sept/Oct 2019 (date TBC). Summary: Pint of Science is an annual science festival which mainly takes place in pubs and cafes. It began as an idea between two slightly naive, bored, and soon-to-be unemployed postdocs. We wanted people to know about the cool science happening behind closed lab doors (and also find out ourselves!) as well as giving scientists a platform to share what they do. By holding all our events over three days of the year we wanted people to be spoilt for choice and choose what interested them. What started as a somewhat bonkers idea, a bit of a laugh and a one-off project to pass the time, in just a few years Pint of Science grew from events in three UK cities to a global phenomenon; during May 20-22, the festival will see 24 countries and over 300 cities taking part, bringing thousands of people together across thousands of events. I'll talk about how a community of passionate and motivated volunteers created something incredible, and where we plan to go next. Speaker: Dr Praveen Paul has a PhD in molecular neurobiology and used to be a postdoc at Imperial College London. She co-founded Pint of Science and helped it grow from a fun project between a handful of friends to a worldwide festival that has been recognised by the national media in multiple countries in just a matter of a few years. She now runs Pint of Science full time. 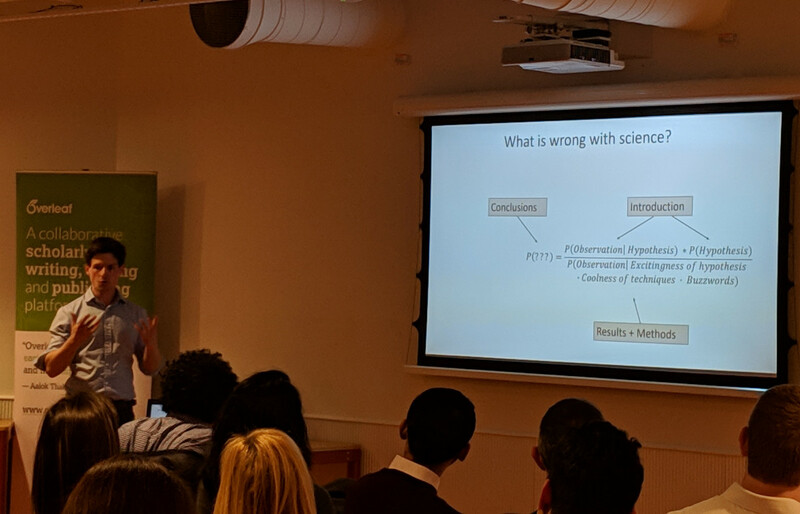 Summary: Heron’s AI-first approach enables unprecedented literature-scale examination of information, promoting experimental standardisation and initiate progress on biomedical reproducibility issues particularly afflicting interdisciplinary fields such as neuroscience. Speaker: Mihaly Kollo is a Neuroscience PhD with 15 years of experimental biology research and data science. As a researcher he runs interdisciplinary projects, on the border of molecular biology, neurophysiology, engineering and machine learning. Summary: Research Square is a new pre-publication platform designed to work alongside journal workflows. As a preprint server, the platform features full HTML renderings of text and figures, commenting and annotation features, and a unique system of badges to demonstrate high standards of integrity, reproducibility and statistics. But what makes the platform really unique is the way it provides journals with a way of opening up their review process, offering more transparency and control to authors. This service, called In Review, allows authors to post their work online as a preprint at submission to a participating journal, and then see detailed updates of the paper’s journey through peer review. Authors can see reviews as soon as they are submitted, and can even suggest reviewers if their paper gets stuck. This increased control has been a big hit with authors, and has led to very high uptake in the BMC Series journals we have piloted with. As a result of this success, we are rolling out to more Springer Nature journals over the course of this year. Speaker: Damian Pattinson is VP of Publishing Innovation at Research Square - a US-based company which aims to make publishing faster, fairer and more useful. He is a journal editor by training, first at the BMJ where he worked on the clinical titles, BMJ Clinical Evidence and BMJ Best Practice, and then at PLOS where he was Editorial Director of PLOS ONE. He has a PhD in neuroscience from UCL. Summary: Scholarcy uses an ensemble of machine learning and AI techniques to turn research papers into summary flashcards which you can annotate and share, with the key learning points highlighted for you. When I was back in full-time study some years before, I'd been frustrated by the number of discovery tools that would recommend what to read, but not why or how I should read them. My problem was absorbing and understanding the information in front of me. Squinting at 100s of PDFs on screen, or printing them off and going over them with a highlighter pen was not really working. I saw a need for something that would help me master the core concepts, give me the main learning points and get me up to speed on a new subject. Around this time last year I was between jobs and was tinkering with a few project ideas in Python. Revisiting that study problem I had years before, I put together a processing pipeline that did some automated linguistic analysis on top of some machine learning libraries I was familiar with, wrapped it up into an API using Flask, and had a simple tool that would parse research PDFs, highlight what looked like important statements, and find key terms and map them to the right Wikipedia articles. Once I wrapped this in a Chrome Extension and built a simple website to promote it, interest started to grow. One year later, I'm working on it full time, I have a wonderful cofounder, and we have publishers using our API and researchers around the world using the app. Emma and I will talk about how we got there and what's coming next. 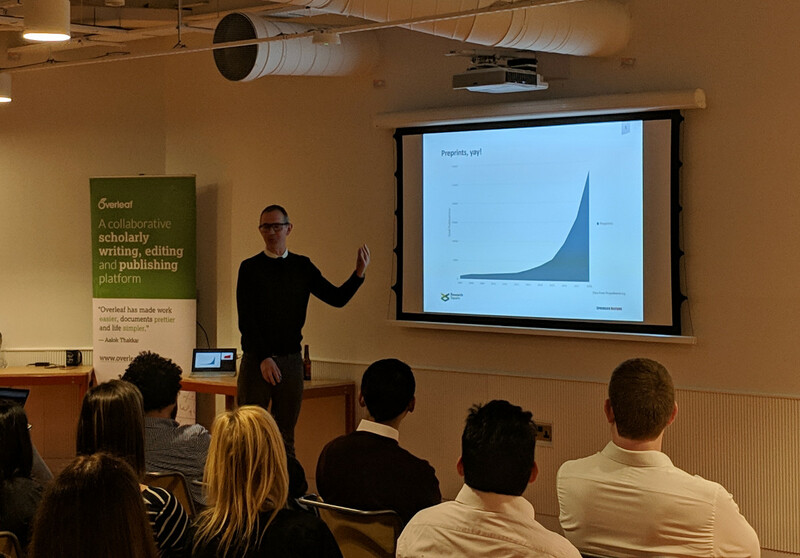 Speakers: Before founding Scholarcy, Phil Gooch and Emma Warren-Jones previously worked together at RefME, a popular reference management tool. Phil has a PhD in clinical NLP and many years’ experience developing text mining solutions for the publishing, EdTech, and healthcare sectors. Emma has many years commercial experience in the Edtech, academic publishing and information industries, launching content & discovery platforms and analytics tools to the global research community. 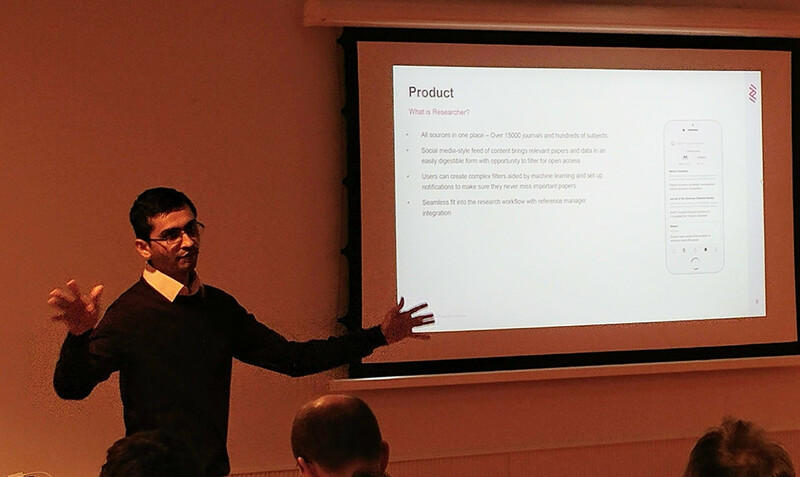 Summary: RosettaHUB aims at connecting the dots between clouds, research software and the DevOps tools and paradigm to provide a "universal" platform for collaborative science. RosettaHUB makes it easy for scientists to assemble the compute infrastructure, the tools and the data they need, access it as a service in the browser and work in collaboration with peers. The RosettaHUB virtual research environments are built on top of a new cloud-native data science and technical computing platform which itself leverages the RosettaHUB multi-cloud governance platform. The latter allows every scientist, student and educator to seamlessly gain access to a dedicated AWS account which is federated, managed and monitored in real time in terms of resources and budget. Besides mass on-boarding, it enables multi-tenant governance, hierarchical customization and compliance enforcement, easy sharing of portfolios of scientific cloud artifacts, etc . The RosettaHUB Virtual Labs leverage Infrastructure-as-Code and the scientist's "personal data center" to make seamless the creation of and control of remote collaborative Workspaces, IDEs, big data and HPC clusters and machine learning environments. 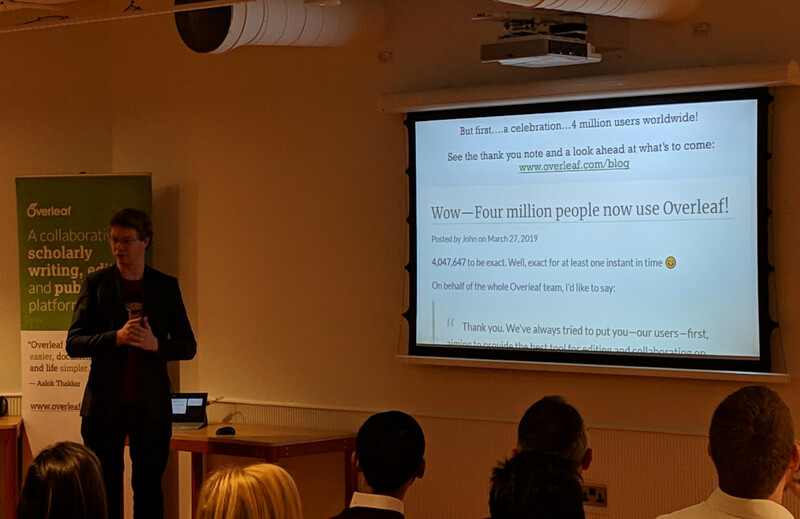 The presentation will provide an overview of RosettaHUB and will share the experience gained from deploying it at scale to deliver AWS and collaborative Virtual Labs access to over 20,000 scientists, educators and students. Speaker: Karim Chine is a software architect and technology expert specializing in research e-infrastructure, cloud computing and e-science. He has over 18 years of experience in large scale distributed systems design and he has been a regular contributor to the EU research and innovation programs as evaluator and expert reviewer of European flagship projects in the areas of HPC, cloud computing, science gateways, future and emerging technologies, Open Science, etc. Karim is the co-founder of RosettaHUB. Summary: Researcher is an app and web platform for scientists and academics to help them keep up to date with the latest literature. We currently have over 700,000 registered users, 10 million abstracts are browsed every month on the platform and we are currently indexing over 15,000 journals. We are backed by Blenheim Chalcot, a venture builder based in Hammersmith, London. Speaker: Ramiz Nathani studied Pharmaceutical Chemistry in University of Mumbai, before moving to the UK to study MSc in Chemical Research in 2008. He went on to do a PhD in Organic Chemistry at UCL, followed by a Post-doc also at UCL. He spent a few years in industry (biotech start up in Oxford - Oxford Nanopore) before deciding to build Researcher with his co-founder Olly Cooper in 2017. They were trying to solve a well known problem - having no efficient way of tracking academic literature. 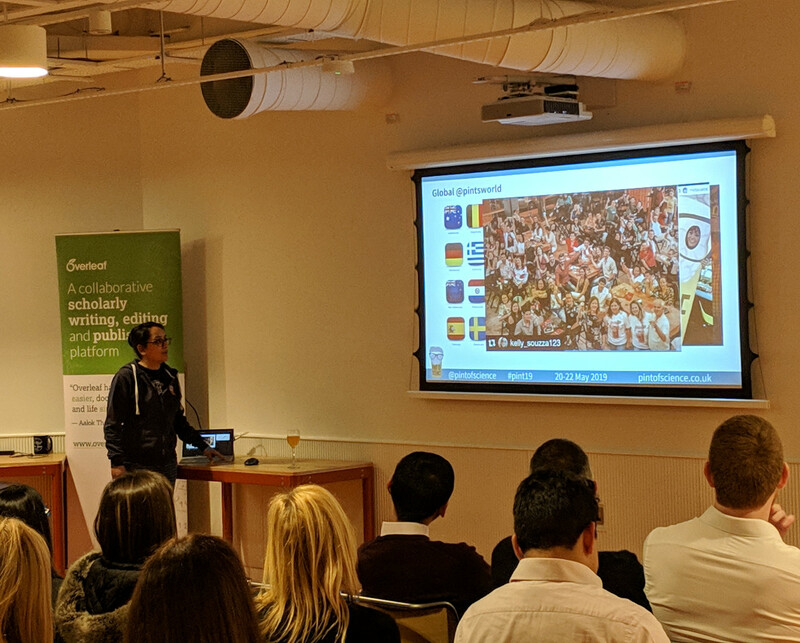 Get in touch if you'd like to speak at our next event! If you'd like to put yourself forward to speak at a future #FuturePub, please let us know and we'll add you to the early shortlist! Our next event will be in Sept/Oct 2019 (date TBC).